According to the National Fire Protection Association, July is the peak month for grill fires. And roughly half of grill related injuries are burns. 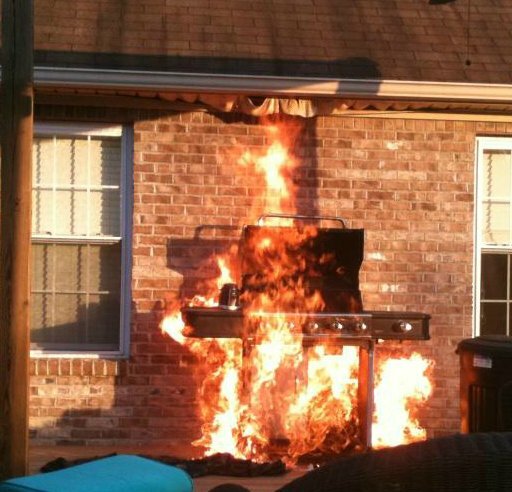 The leading causes of grill fires were: a failure to clean, having the grill too close to something that could catch fire, and leaving the grill unattended. Position the grill well away from siding, deck railing, and out from under eaves and overhanging branches. Many folks are surprised at how fast vinyl siding can melt from a hot grill that is too close. If you are using a gas grill and the flame goes out, turn the grill and the gas off, then wait at least five minutes to re-light. LP Gas is heavier than air, so it can quickly collect in the bottom of a grill. When using charcoal grills, Purchase the proper starter fluid and store out of reach of children and away from heat sources. Never add charcoal starter fluid when coals or kindling have already been ignited, and never use any flammable or combustible liquid other than charcoal starter fluid to get the fire going. Be safe and enjoy your grilling! 3 pm update from the National Weather Service concerning the approaching storm system. They are already seeing some severe thunderstorms with isolated tornadoes in eastern NC in front of the main line of storms and they expect that to continue through the evening. The timing of the main line of storms for our area is about 0200 thru about 0600 hrs in the morning. Again this timing is an estimate. They indicate that we could see winds gusts up to 75 mph with these storms; forecast sustained about 35 mph out of the south. No coastal flood warnings currently, but we could see in some areas about a foot above ground north of Oregon Inlet. 20-foot seas on the open water, 4-foot on the sound. Any soundside flooding threats tonight for Colington? Should we move cars? The National Weather Service at Newport has forecast strong storms for our area Friday afternoon into Saturday. The High Wind Watch has been upgraded to a High Wind Warning for the Outer Banks. Soundside flooding is possible. We would truly be lost without our friends at Dare Central Communications. Answering the calls for help and getting the right resources on the road to serve you! Undoubtedly the most underappreciated of the public safety team.